Is It OK to Exercise If You're Sore? If you exercise regularly, you're no stranger to discomfort. It might be the burn you feel as lactic acid builds up in your muscle or the soreness that follows in the days after. 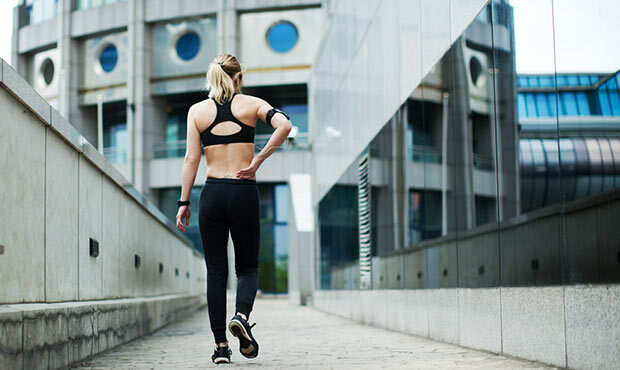 Delayed onset muscle soreness, or DOMS, is common, particularly for those who are new to working out or are returning to the gym after a long absence. The pain and discomfort level can become so high that it can discourage you from exercising. Even though it hurts, you shouldn't skip a gym session. DOMS arises from difficult workouts that cause micro-tears in the muscle. It's the tears that cause the feeling of soreness. Don't be alarmed; while it sounds like intentionally tearing your muscles would be a bad thing, these micro-tears cause the muscle to grow and become stronger. These tears do need time to heal. Because your muscles need time to recuperate and grow, prevailing wisdom states that you should give sore muscles 1 to 2 days of rest before exercising them hard again. So, if your chest and triceps are really sore from an exercise routine, you need to take some time off and let them rest before doing another chest and triceps workout. That doesn't mean you can't exercise. Many workout programs are designed with this mind, and give muscles ample time to recover before working them out again. Classic weightlifting programs such as the push/pull workouts, or the legs/chest/back workouts, allow for 1 to 2 days between sessions for muscle recovery. The upshot? You can work out if you're sore. Don't exercise the same muscle groups that are hurting. Do legs one day and exercise your upper body the next. By doing so, you'll still be able to get exercise and allow your lower body to recover and rebuild. If you aren't following a pre-planned routine, just make sure that you're giving your muscles ample time to recover. For example, don't do a bunch of squats one day and a tough lunge workout the next. Break those workouts up by another day or so and you'll see improved results. Remember, you get the results you want when you allow your body to rest. When your body is taking a nap, hanging with your friends or lounging, your body is rebuilding. If you keep doing chest exercises every day, you're going to create imbalances, and possibly injure yourself.